Babies have fragile immune systems, and antibiotics can put them at risk for diseases like asthma. Did you know that asthma is one of the most common chronic diseases of childhood? A new study aims to shed some light on the link between probiotics and asthma, possibly offering a cure to this common disease. Their "hygiene hypothesis" says that babies who do not have exposure to bacteria and viruses have weakened immune systems and are more susceptible to diseases like asthma. The idea that babies need bacteria to develop their immune systems is not a new one. Babies are inoculated with good bacteria and yeast (also called probiotics) when they pass through the birth canal and then again when they drink breast milk. But if a mother does not have enough beneficial bacteria and yeast in her body, she cannot pass on that base for strong immunity to her child. Probiotics suddenly become important, especially if a mother's health is compromised. These findings indicate that probiotics, like Lactobacillus are crucial to a baby's developing immune system! Antibiotics can be beneficial and wipe out bad disease-causing bacteria, but they destroy the good microorganisms too. In babies, antibiotics can be especially devastating to their fragile immune systems. A recent study found that children who received antibiotics during their first year of life are twice as likely to develop asthma before the age of seven! Antibiotics are not always an amazing cure-all and may even cause more disease. Learn more about the dangers of antibiotics in How Just One Dose of Antibiotics Can Threaten Your Long-Term Health. So how can you take care of your little one to prevent and treat childhood asthma? Build your own immunity. If you are pregnant, nursing, or planning your family, Follow a healthy Body Ecology program to build a healthy inner ecosystem thriving with beneficial bacteria and yeast. Learn more by reading: What Every Girl & Woman Needs to Know NOW If She Ever Wants to Have a Baby. Your health can directly impact the health of your baby. Give your baby probiotics from fermented foods and drinks. Babies can drink 1 teaspoon of Young Coconut Kefir 3 times per day or the juice of cultured vegetables. Read Julia Berle's story of how fermented foods saved her family! Try pre-made probiotic drinks like InnergyBiotic and Coco-Biotic. Body Ecology's InnergyBiotic and Coco-Biotic are easy and DELICIOUS ways to introduce beneficial bacteria into your diet. 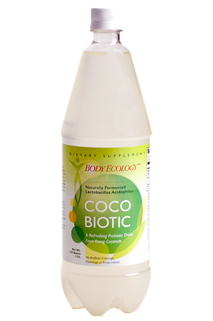 Coco-Biotic is a delicious probiotic beverage that is perfect for expecting mothers or moms on the go! Packed with probiotics, Coco-Biotic makes it easy to help you and your family build strong immune systems. Asthma does not have to be a common disease any longer. With the use of probiotics to build immunity and fight disease, you and your family can treat and prevent childhood asthma. "Can Probiotics Prevent Asthma in Children?" Science Daily, 15 May 2006. ibid.